“So the angel swung his sickle across the earth and gathered the grape harvest of the earth and threw it into the great winepress of the wrath of God” (Rev. 14:19). In the history of the United States, several songs have been sung by its army as it marched into battle. During the Civil War, one of the hymns used by the Union Army was “The Battle Hymn of the Republic.” The first stanza of this song reads: Mine eyes have seen the glory of the coming of the Lord: He is trampling out the vintage where the grapes of wrath are stored; He hath loosed the fateful lightning of His terrible swift sword: His truth is marching on. Regrettably, few Americans today understand the rich theological significance of these lyrics. They are in fact inspired by Revelation 14, which describes the coming of the Son of Man in judgment. Descending on the clouds, He unleashes His sickle and sends forth His angels to harvest the wicked and cast them, like sour grapes, into a winepress where they are crushed (vv. 14–20). If anything is clear from this chapter, it is that the Son of Man is the One who will execute wrath on the last day. “Son of Man,” of course, is Jesus’ favorite self-designation (Matt. 12:40, and many other passages), and it is drawn from Daniel 7:13–14. The king who receives an everlasting dominion in Daniel 7 is Jesus, the same king who executes the wrath He shares with the Father toward sin. In a day when many people respect Jesus as a “wise teacher” and view Him as someone with so little conviction that He would tolerate gross perversity in the name of “love,” we dare not ignore the reality of His wrath. We must “kiss the Son, lest he be angry” (Ps. 2:12). Our only shelter from God’s wrath is in loving service to the Davidic king — His instrument of justice. This king is the Messiah, the Lord Jesus Christ, who sets His anger against all who remain impenitent. This Jesus came once as Savior, and will come again to be the Judge “of the living and the dead,” in the words of the Apostles’ Creed. All will bow the knee to Him (Isa. 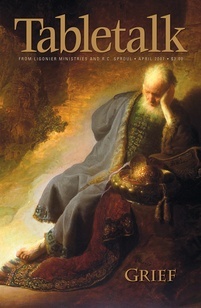 45:22–23; Phil. 2:9–11) on that day. Some will do so willingly, in love and worship just like the Samaritan leper (Luke 17:11–19). But even those who hate Him will be forced to kneel. At His return, Christ will strike His enemies with a “rod of iron,” forcing them to bow to the king of heaven and earth (Ps. 2:9). The humble and meek Jesus whom most people will embrace is also the holy and wrathful Jesus whom most people would rather forget. When we present the Gospel to non-believers, let us never forget to tell them that if they will not submit to Christ as Lord and Savior today, they will feel His wrath after they die. Look for an opportunity to present Jesus Christ as Judge and Savior to someone who is lost in sin.